View More In Oxygen Accessories. 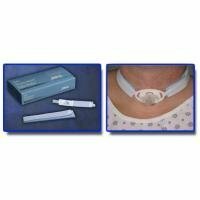 The dale tracheostomy tube holders are designed to provide secure positioning and to minimize movement of the tracheostomy tube. The moisture wicking lining on the 2-piece, adjustable Neckband leaves the skin dry, reducing the risk of skin breakdown. Secure and easy to use fastener tabs fit any Size TRACH plate. Manufacturer: Dale Medical Products, Inc. Publisher: Dale Medical Products, Inc. Studio: Dale Medical Products, Inc. If you have any questions about this product by Dale, contact us by completing and submitting the form below. If you are looking for a specif part number, please include it with your message.